I’m really not sure you can beat the combination of blueberries and lemon when it comes to desserts. Add white chocolate to the mix and it’s over the top. I haven’t posted a dessert recipe in a while and as I was pondering what I should make, this recipe immediately came to mind. I adapted this cake recipe, which I’ve made several times, as cupcakes and I was very happy with the results. This recipe produces fairly dense cupcakes, so it’s important to not overcook them. I made the cupcakes two times, cooking them 1 or 2 minutes less the second time. I was much happier with the texture in the second batch. When I inserted a toothpick at 20 minutes, they were not done, but 1 or 2 minutes later the toothpick came out clean. After 20 minutes, begin testing every minute to ensure you don’t overcook them. The icing for these cupcakes might be just about the best thing I’ve ever tasted. There are only four ingredients but the combination is delicious. For the first batch of cupcakes, I applied the icing with a small icing spatula. For the second batch, I decided to pipe the icing onto the cupcakes for the photograph. I quickly realized that I was applying twice the amount of icing with the piping bag, so I ended up making double the recipe. Depending on how you intend to ice the cupcakes, consider doubling the recipe. 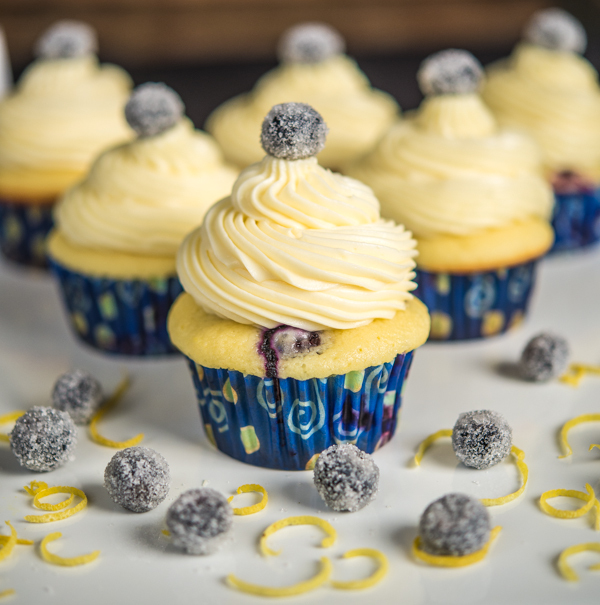 I garnished these cupcakes with sugared blueberries. To sugar the blueberries, lightly beat 2 egg whites, dip the blueberries in the egg, and roll in sugar. Place blueberries on wax paper until they are dry. 1. Preheat oven to 350°F. Place 24 cupcake papers in two muffin tins. 2. Sift flour, salt, baking powder, and baking soda into a medium bowl. 3. Using electric mixer, beat butter in large bowl until fluffy. 4. Gradually add sugar, beating until blended, scraping down sides of bowl occasionally. 5. Beat in lemon juice and zest, then eggs 1 at a time. Continue to beat until well blended. 6. Beat in dry ingredients in batches alternating with buttermilk. 8. Fill each cupcake paper with 1/3 cup of batter. An ice cream scoop works well for this part of the process. 9. Bake cupcakes for 20-25 minutes or until inserted toothpick comes out clean. Carefully monitor after 20 minutes. Cool cupcakes in muffin tins for 5 minutes. Remove muffins from tins and cool completely on cooling rack. 1. Melt white chocolate in double boiler over simmering water. Remove boiler top from water, stir until smooth, and cool until lukewarm. 2. Using electric mixer, beat cream cheese and butter in large bowl until blended. When completely cooled, ice the cupcakes with a small cake spatula or piping bag. If you use a piping bag, you will be applying more icing to each cupcake and you should probably consider doubling the recipe. This photo just caught my eye on the sidebar. Stunning! HI, I’m with you on lemon and blueberry. What a wonderful combination indeed. Your cupcakes look beautiful, and the icing with the piping bag looks perfect. These cupcakes are a great dessert for a summer picnic. You have the most beautiful food pictures I think I have ever seen! Keep up the good work! I just saw this post – these sound sooooo good! The white chocolate icing – mmm mmm mmm!!! Yet another reason someone needs to invent a “scratch and taste” laptop/monitor!